Bus from Johor Bahru to Klang is the most convenient way to get to Klang. Passengers especially working adults and students prefer bus over train or flight is because train and flight from Johor Bahru to Klang are non-direct services. Passengers taking flight or train need to take transit at either KL Sentral, KLIA or KLIA 2 to Klang. City Holidays Express, Maju Express and Causeway Link Express are the few larger players providing frequent departure from Johor Bahru to Klang. Starmart Express is relatively smaller in term of daily departure provided while JB Transliner is an agent representing Kwok Ping in Johor Bahru. The largest player for this bus service is City Holidays Express by having 7 departures daily. The range of bus fare for bus from Johor Bahru to Klang is from RM 37.00 - RM 38.70, depending on your selection of bus operator. The estimated travelling time takes about 5 hours to arrive Klang Sentral, depending on the traffic and weather condition. Bus Operator Choice and Coach Type? 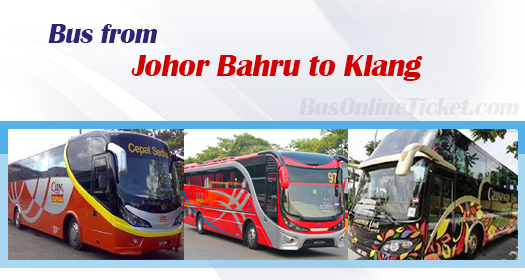 There are numbers of operators providing the bus from Johor Bahru to Klang. With the numbers of choices, some passengers may be wondering which coach to take. Here are some suggestions. Passengers are advised to check the coach brand, coach type and operator punctuality. City Holiday, Maju Express and Causeway Link are strong brand in Southern Malaysia providing punctual and VIP bus service plying between Johor Bharu and Klang. Even there are multiple schedules from Johor Bahru to Klang to choose from, passengers are advised to book ticket online at BusOnlineTicket.com instead of last minute ticket purchase over counter. This is because ticket could possibly be sold out even on weekday, especially the famous brands. Besides that, book ticket online could avoid the touting services in Larkin Bus Terminal.